Hey, hi! Happy first FRIDAY of November! I actually cannot believe it’s the first Friday of November, I only wait for this time to come around ALL YEAR long, so to say that I am a tad bit excited would an understatement. 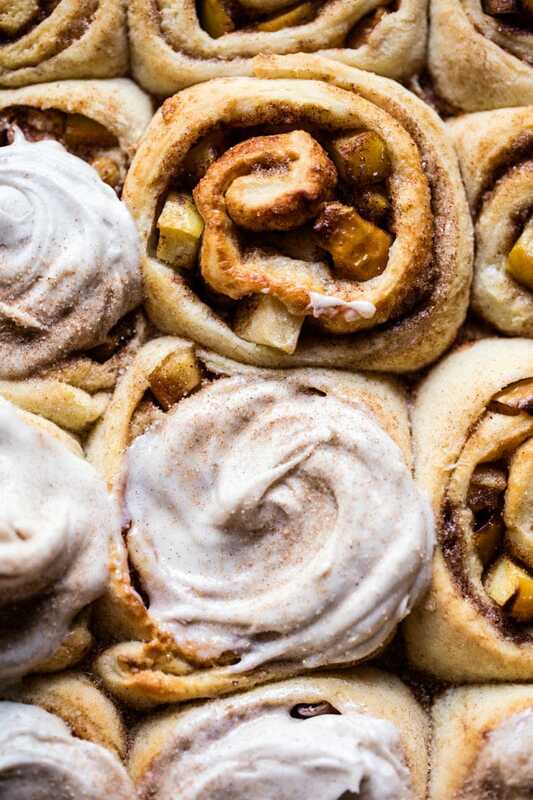 I mean, for one we have these cinnamon rolls to talk about, and two, it’s officially time to start talking holiday food! Umm, yess! And I could not think of a better way to end the first Friday of November than with fluffy, gooey and buttery apple cinnamon rolls! Say hello to Saturday brunch everyone! Cinnamon rolls hold a special place in my kitchen, and by that, I really just mean that I love them to pieces. Growing up, my mom would occasionally buy the cinnamon rolls that come from the can around the holidays, and my brothers and I LOVED them. 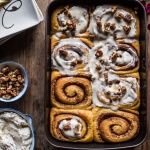 We looked forward to these cinnamon roll breakfasts every single year. I mean, what kid does not love a good cinna-roll, you know? Well, at some point down the road I decided to try my hand at making my own cinnamon rolls. Maybe as an attempt to avoid the inevitable food coma that always followed our face stuffing frenzy. 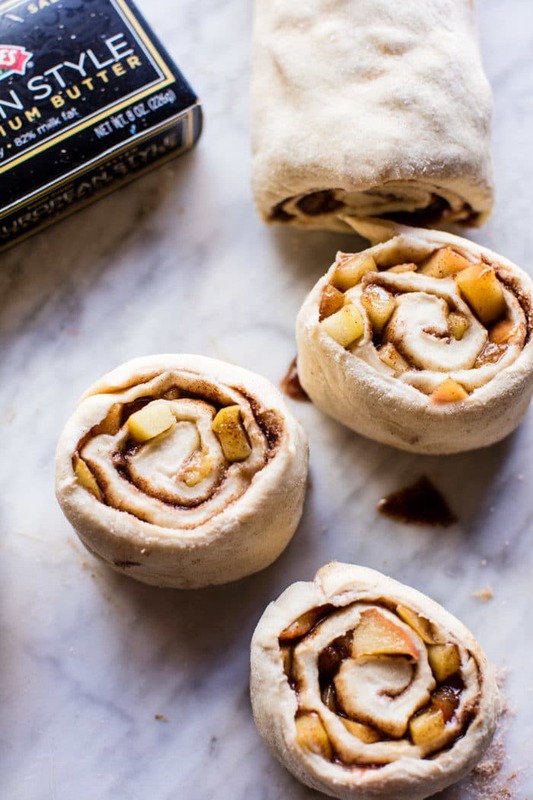 I mean, homemade is always better, and you guys, these apple cinnamon rolls are no exception. From that day on, I never looked at another canned cinnamon roll again. Anyone else have a similar experience? I always use the same base dough for my cinnamon rolls. It’s a base of butter, eggs and milk. 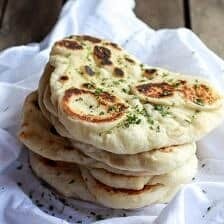 Super simple, but really doughy and perfect. Next comes the caramelized apple filling… so amazing. 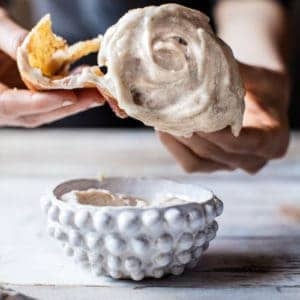 The the rolls are topped off with the most delicious cream cheese chia spiced frosting. Whoa! A little more on the filling here, because it really is amazing. Brown sugar caramelized apples, spread over a generous layer of salted butter and cinnamon sugar. The secret here is Land O’Lakes European Style Super Premium Salted Butter. This butter is the perfect ingredient to add just a touch of holiday specialness to these cinnamon rolls. The sweet European style cream with a hint of salt goes a long way, and is really what sets these rolls apart. Okok and well, the frosting helps too!! 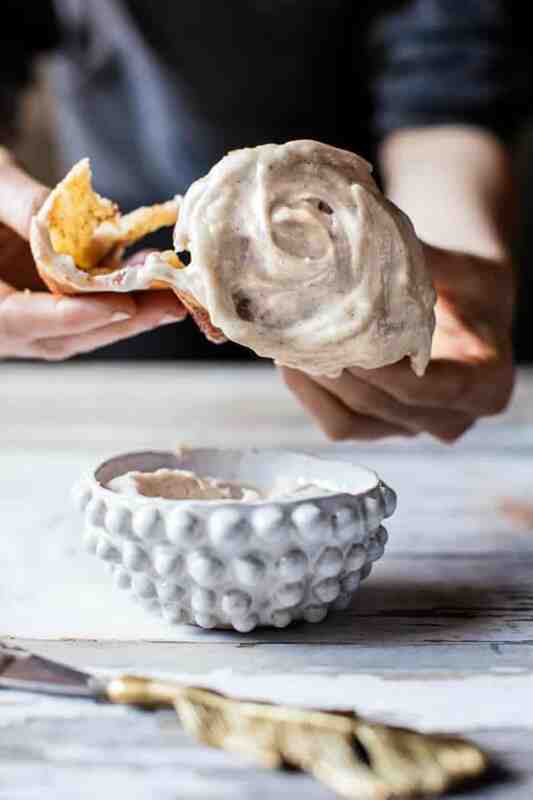 Oh my gosh, this frosting is to die for, so delish! I mean, chai spiced cream cheese frosting…with more salted butter…you know, for good measure! Yeah, it really is just as good as it sounds. Actually, it’s better!! Think about your favorite chai tea, but with whipped cream cheese, a little sugar, a little butter and a ton of vanilla. You just cannot go wrong with a combo like that. 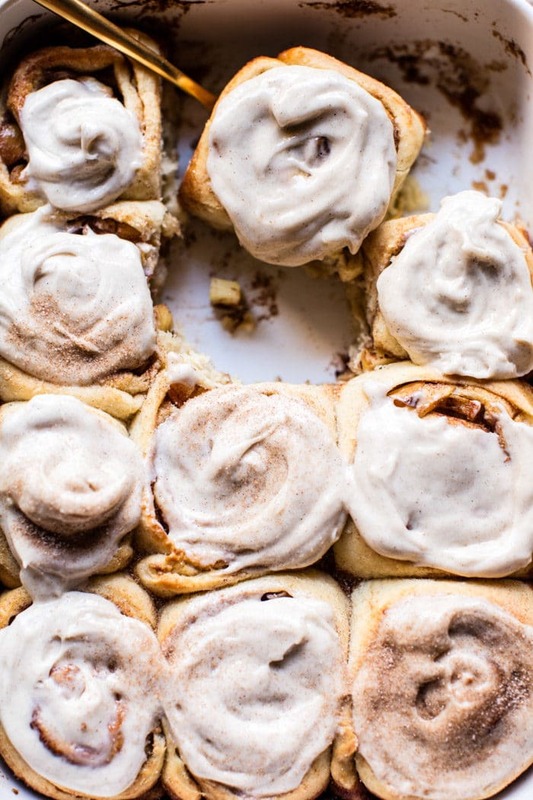 Put this all together and you end up with the most perfect (and most delicious) cinnamon roll. Like FOR REAL, I wish I could truly express just how much I love these rolls. 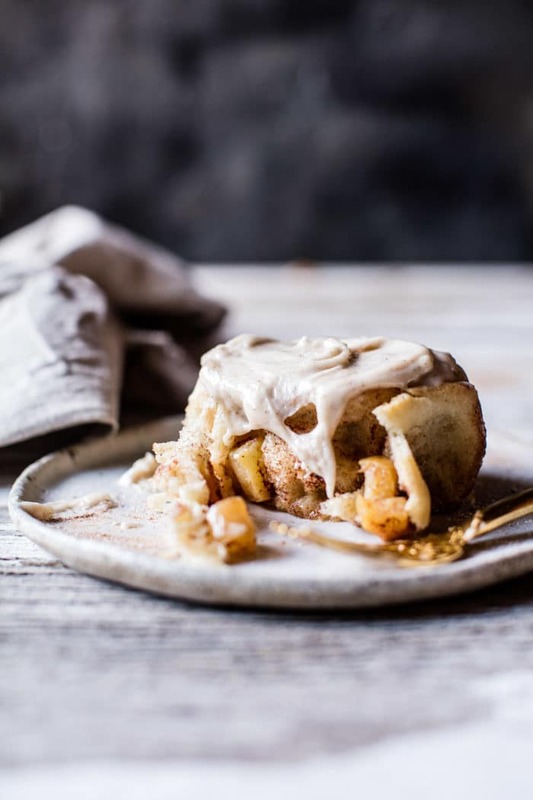 Even my picky brothers, who are cinnamon roll purists, enjoyed these apple stuffed cinnamon rolls, and you know what… they said the frosting was the best they’d ever had. The point in all my rambling here, is that these are truly one of my favorite breakfast or brunch rolls. They’re perfect for any upcoming holiday gatherings you may be hosting or attending. Plus, cinnamon rolls are great because they can be made in advance and then baked just before eating. Avoiding morning chaos… score! I already have plans to serve these Thanksgiving morning, but I will for sure be making a double batch, as I know these will be downed within seconds…they are just THAT good! I mean, that frosting alone…still dreaming about it. Oh and also, is chai the spice maybe just the best thing ever? I am thinking so… more chia to come this November! To make the dough. Place the yeast and 1 tablespoon brown sugar into a stand mixer with the dough hook attached. Add the warm water and gently stir. Let sit until yeast has doubled and is puffed and foamy on top, about 10 minutes. To the bowl add the melted butter, warm milk and egg, stir to combine. Add in the flour and salt. Knead the dough with the dough hook until the dough is smooth and forms a ball, about 5 minutes. Remove the dough from the bowl and oil the bowl or use cooking spray. Place the dough back into the bowl and cover with plastic wrap. Let the dough rise in a warm area for about 1 hour or until doubled in size. Meanwhile, make the filling. Heat a large skillet over medium heat and add 1 tablespoon butter. Add the apples and 2 tablespoons brown sugar. Cook, stirring often until the apples are caramelized, about 5 minutes. Remove from the heat and let cool. Add the sugar and cinnamon to a bowl and mix well. Generously grease a 9×13 inch baking dish with butter. Lightly dust a surface with flour. Roll the dough into a rectangle (about 9×24 inches). Spread the 5 tablespoons of butter evenly over the dough. Sprinkle the cinnamon sugar evenly over the butter and lightly push the cinnamon sugar into the butter. 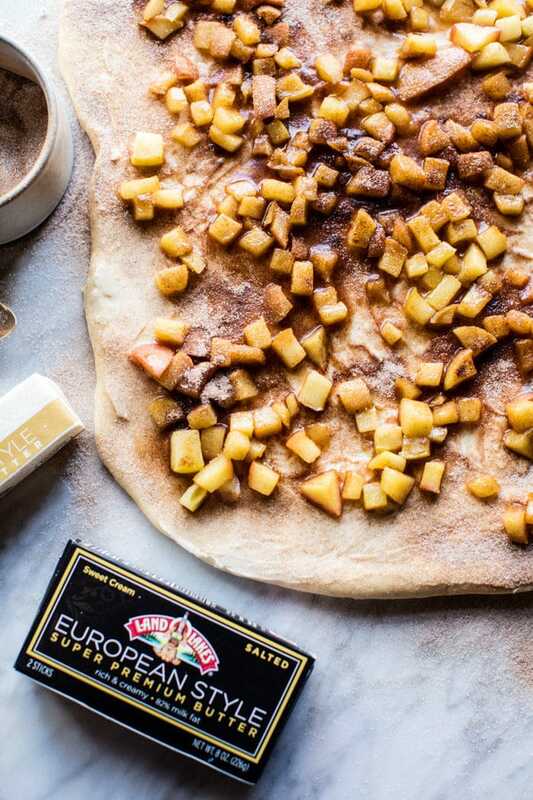 Evenly sprinkle the apples over the dough. Starting with the long edge closest to you, carefully roll the dough into a log, keeping it fairly tight as you go. When you reach the edge, pinch along the edge to seal. Place dental floss or a thin piece of string (do it, it works so well!) under the roll where you want to cut. Mine are usually about 3/4 to 1 inch thick, but vary. Take the ends of the floss in each hand and wrap them around the roll. Keeping the ends of the floss in each hand (don’t let go) tighten the floss so it starts to cut through the roll. Again, don’t change hands. Tighten until the floss comes out and the individual roll is separated. You can make eight larger rolls OR 10-12 smaller rolls. Place rolls in the prepared pan. Cover with a damp cloth or plastic wrap and allow to rise in a warm place until doubled in size, about 30 minutes. Preheat oven to 350. Just before baking, brush the remaining 2 tablespoons butter on top of the rolls. Bake the rolls for 25 minutes or until golden brown. Meanwhile, make the frosting. In a medium bowl, beat together the cream cheese, butter and vanilla until fluffy. Add the powdered sugar, cinnamon, all-spice, ginger, and cardamon and beat until combined. Spread the frosting on warm rolls. EAT! FYI: A rolled up doughy glimpse into heaven right there. 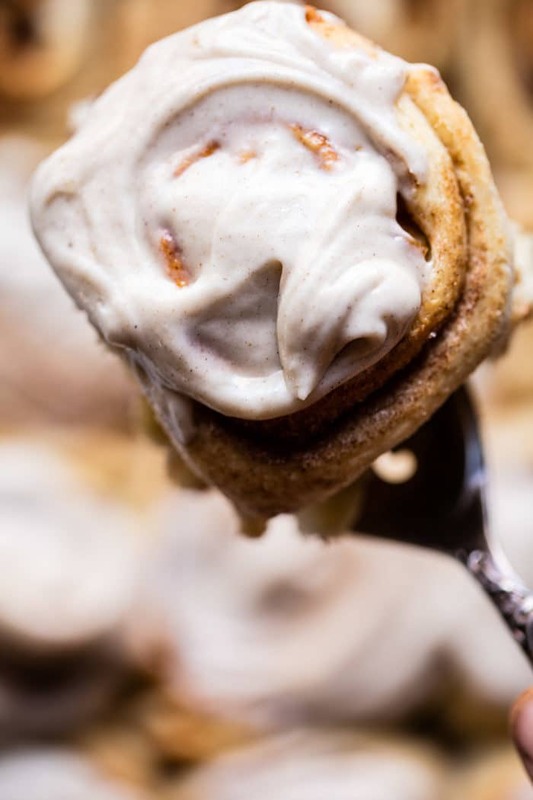 Sweet Potato Pie Cinnamon Rolls with Butter Whipped Meringue Frosting. Chia? Maybe chai? Making this weekend as a test run! They look so delicious. Ha I thought the same about the chia and wondered how chia seeds would be weird in a frosting, chai frosting sounds awesome! Haha! Sorry about that!! Hope you love it! Looks great….. pretty sure u mean chai!! Haha, I kind of feel like saying “Thank you so much for sharing these….but why did you have to share these DANGEROUS things???? 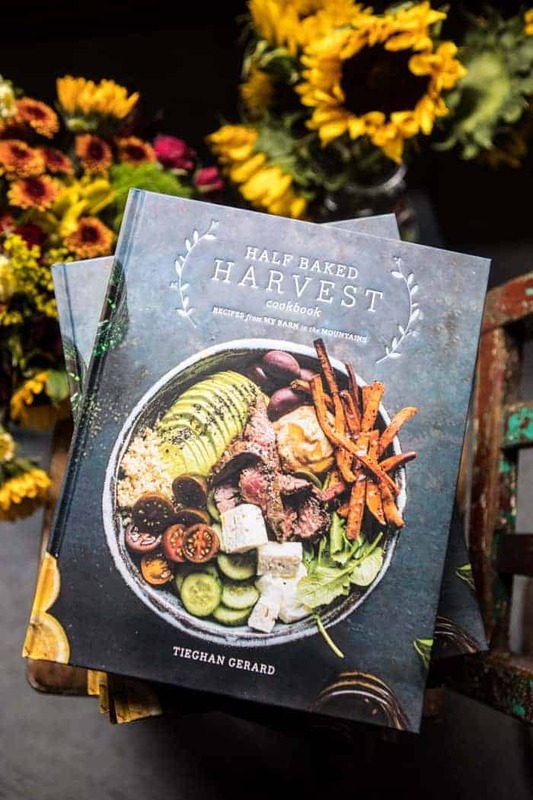 ?” Totally JK, but these really look incredible Tieghan! Haha! They’re too good!! Thanks Tori! Chia are little seeds…pretty sure you mean chai. These look incredible!! 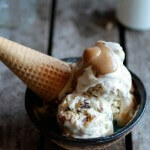 I love the idea of chai frosting! Also, where did you get that plate in a few of those pictures?! It’s so beautiful! Have a great weekend! You have a new fan! Your quite brilliant! I really must try these! This sounds great but where is the chia? Sorry, Typo!! Chai not chia! woooooooooooooooooooooooooooooooow cinnamon rolls. WOW. oh my god. Oh my god. Nothing like some yeasty, soft bread to make my Friday! Ah!! Agree! So happy you like them!! Oh my goodness, HOW have I not tried this Euro-style butter yet?? This recipe looks like the perfect way to make the most of it. I don’t know!! But now you can!! Thanks hope you love it Erin! I kept wondering why I didn’t see Chia seed specs in the frosting…I get it now, Cream cheese CHAI frosting! Look so delicious. Definitely making these. King Arthur Flour has a chai spice powder that is so easy to add to baking. lol. Chia has changed to Chai. But there is no Chai in the ingredients or instructions. I believe she’s going to a Chai type spice blend. Apparently, Chai is a mixture of the spices you have listed. I didn’t know that. Sorry for the ignorant commants. Is there any better way to start the day?? I don’t think so? These look incredible!!! Do you think they could be made the night before and baked in the morning? Ahh yes!! You have to make them! You’ll lose these! 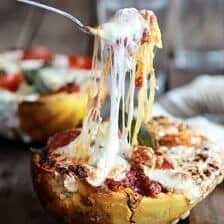 Hi Tieghan – I plan to make these over the weekend, sound delicious. Maybe the confusion with chia vs chai is that in your photo and comments section about the recipe chia is still mentioned at least four times! Happens to me all the time if I’m not wearing glasses. 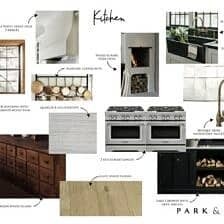 Wonderful recipes and website. Hey Nancy! Thank you for letting me know! all is fixed now. Hope you love the cinnamon rolls! 🙂 Ps. thanks so much for the kind words!! Omg! I could eat this everyday and not get tired of it! Love the fall flavors! Ah!! Thanks Andrea!! I couldn’t stop snacking myself!! These are my kind of cinnamon rolls!!! Delish Teighan! Oh, these are fantastic!! And there’s just nothing quite like the smell of cinnamon rolls coming out of the oven, especially during the Holidays! It’s the best smell!! Thanks Katerina!! Holy gooey-ness. I need these. (: Hope you love them!! These look fantastic! I will have to look for the European-style butter – I would love to try it. I hope you can find it! I think you will love it! I’m not a huge chai tea lover but I LOVE the flavor in baked goods. These are EPIC! These look amazing!! A local bakery makes a apple pull apart roll out of brioche dough and they are delicious, but the lame drizzle of icing on top is always a let down. They need something like your chai cream cheese! I will have to try making them for myself, just to confirm;) Hehe. I hope you love this Maria! Let me know how it goes! Thanks? 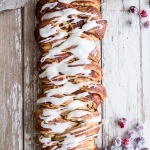 I love the addition of chai spice to the cinnamon roles!! They look amazing! I enjoy the data on your websites. Regards!. Can you freeze these and bake them later? Can these rolls be frozen before they are baked? It would be nice to have some in the freezer and be able to thaw a couple for fresh baked rolls. We’re a small family and I try to bake-once-eat-twice (or more!). Hi! Yes, that works great! I would taw overnight in the fridge then bake as directed. Let me know if you have any questions. Hope you love these! Thank you so so much Sarah! 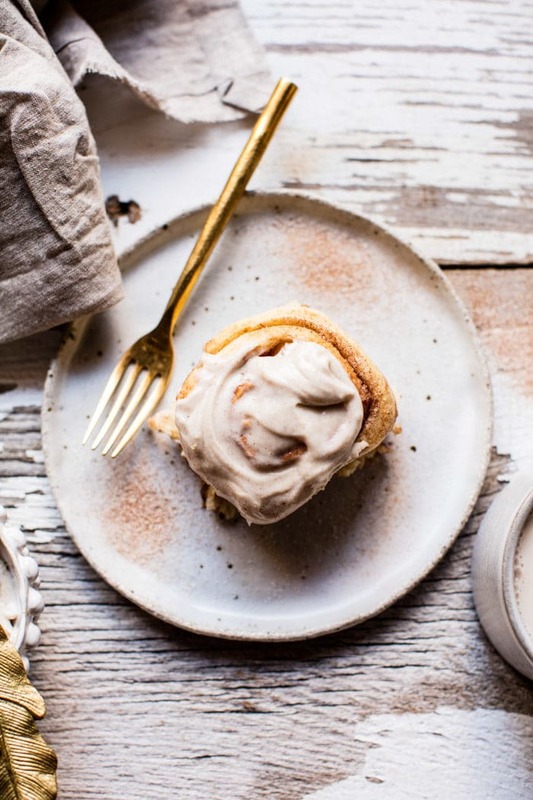 These rolls are dreamy, love the chai frosting! Thank you so, so much Laura!! SO happy you are loving these! Hey Shannon! Yes, refrigerating them works great! Just let them sit on the counter while you preheat the oven. Let me know if you have any other questions. Hope you love these! Ended up making them Monday evening instead of Sunday and did it overnight in fridge and baked this morning! I’m not sure they rose as much as they should have the second rise but they worked out all the same! Really tasty and am so impressed we managed it the first time, haha. Thanks for another fab recipe…it really impressed the in-laws lol! We did a buttercream instead of cream cheese icing since hubby doesnt like cream cheese (yes i knew this when i married him, he is crazy) and it worked great! AH!! Sounds like they went perfectly!! Thats so awesome!! Love that the in-laws were impressed!! Hi! Can’t wait to make these for Thanksgiving morning. Would this be good with almond flour/gluten free flour instead of regular? 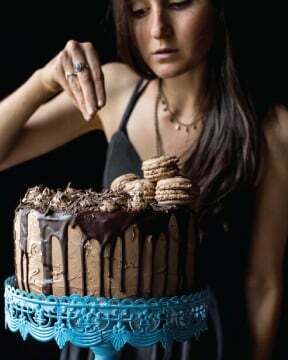 Also, wondering if I can use instant chai powder/spice mix for the spices used in the frosting. Lastly- i’ve heard of making chai-flavored breads/cakes by substituting steeped chai tea for the water. Have you tried this? Thanks so much! HI!! I have never tried using a gluten free flour, so I really cannot say. I think if you use it regularly, then you should give it a try. Let me know if you have questions. Thank you so much. I have never tried using the teat, but I have seen that too. I am sure it would be great! ? Hope you love these! ? Hello! My husband and I made these this past weekend. They were so delicious and perfect for the cool weather. My 2yo couldn’t get enough either. Thank you for the great recipe!! I made these last night and they were perfect!!! 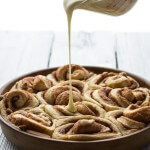 The last cinnamon roll recipe I tried was just too sweet all around (sounds impossible but true!). These were so amazing. Thank you for this recipe! So happy you liked them Lauren!! Thanks for making them and Happy Thanksgiving!! ? Hey Laura! So happy you love these! 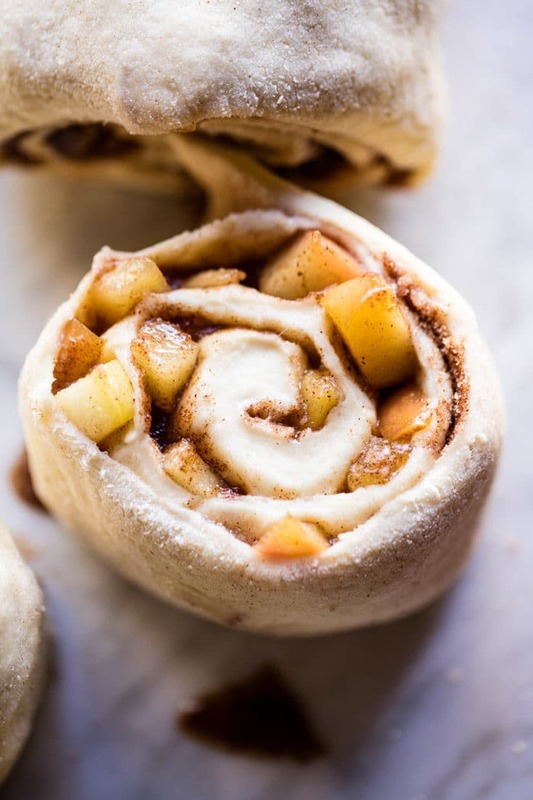 Leaving the apples out will be great, just like regular cinnamon rolls! Let me know if you have other questions. Merry Christmas! I just made them and are doing the cold overnight rise to enjoy chrismas morning… The dough is absolutely fabulous! I am SO EXCITED to eat these tomorrow! So happy you liked them! Hope you loved these! Thank you! Cinnamon rolls also hold a special place in my heart, but I haven’t found the time to make them in my own kitchen! Maybe that’s okay, because I’d eat the WHOLE batch afterwards! Perfect! I hope you love these, thank you Stephanie! 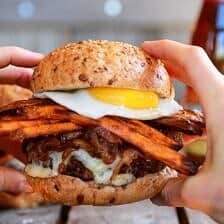 this looks so delicous, I woulf love to try the recipie! How much butter comes into the dough? The one stick salted butter or the 2 sticks salted and normal butter? You are truly a girl of my own heart! I love your website so much! Thank you so much for sharing your talents. For as long as I can remember I have been making an average of 12-15 dozen of cinnamon rolls every holiday similar to yours but I always did pecans and cherries with traditional icing. I cannot wait to try this! To celebrate completing another semester of school my friends are going to have a celebratory cinnamon roll party, we are making these. Are there any alcoholic drinks you make that would pair well with them? Can these be stuck in the fridge like the overnight gingerbread cinn. rolls? Then baked the next morning? Could I make these rolls and freeze before baking them? Hi Tieghan! I’m planning to make these for Canadian Thanksgiving tomorrow (super excited). 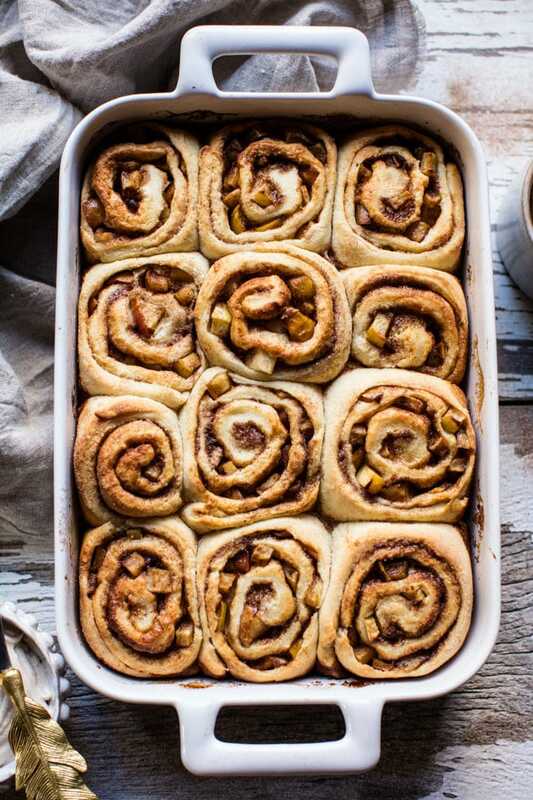 Just wondering, can I prepare the rolls up until the point of “Cover with a damp cloth or plastic wrap and allow to rise in a warm place until doubled in size, about 30 minutes.”, and let it sit well PAST 30 minutes? I.E. Can I prepare everything at home, transport it to another location, and then put it in the oven later in the evening so that the rolls are ready just after dinner? I would like to make this Friday morning but eat them Sunday morning. Is that possible? Do I just wait until Sunday to cook them? Traveling to Tahoe and need to have them prepared ahead of time. I made these the night before and let the final rise happen in the refrigerator overnight. They were WONDERFUL. 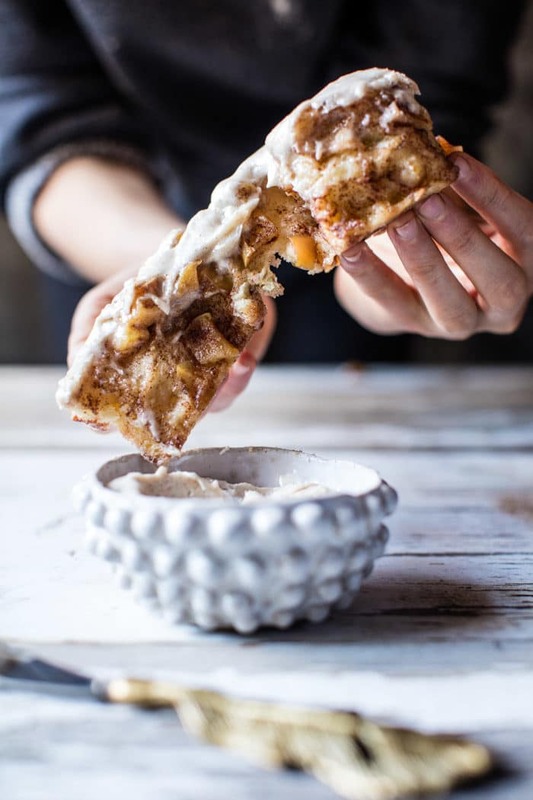 This cinnamon roll dough is going to be a new go-to, it’s light and flavorful, and has the perfect amount of filling without being too sweet. The spices in the frosting also added a lovely dimension to these rolls! My husband is quite picky about his sweets and loved them, as well! Thank you so much Lauren! I am so glad you loved drink and it turned out so amazing for you! These turned out amazing. Everyone asked for the recipe. This will probably have to be my go-to brunch/dinner/snack contribution from now on. Thanks for sharing! Hi. Really love your recipes. They are a staple in our home. Just wondering if you could do the second rise overnight in the fridge?